A few years back I bought an Oriental rug for our living room. I have to state for the record that I appreciate the value, beauty and workmanship of fine oriental rugs but, having said that, I view carpets in my own home as a place for the kids to spill drinks, the dog to poop and the cat to throw up upon. 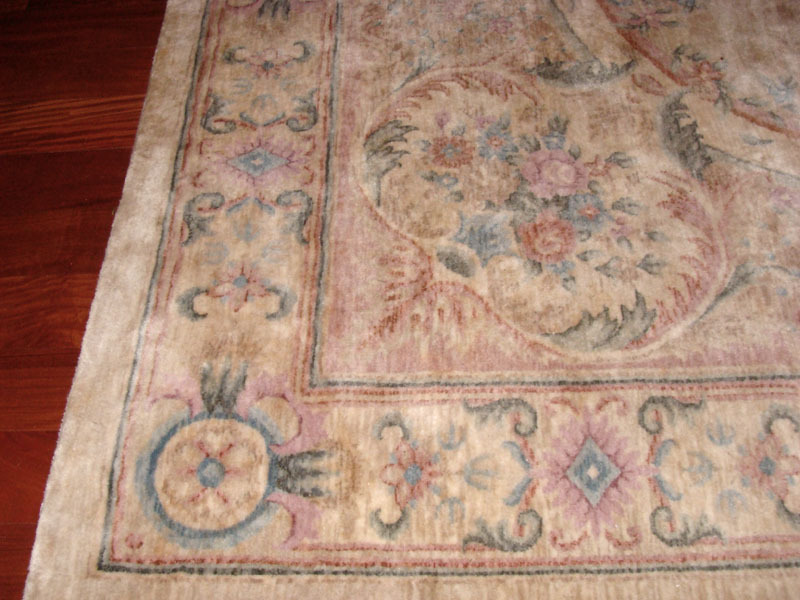 So it was with great trepidation that I purchased this very beautiful and expensive 10 x 14 pale-colored Oriental rug. I plunked down all my money and then patiently waited for 16 weeks for the rug to be hand made in some unknown village, just for me. It arrived on a Friday and it was everything I had hoped it would be. It was the perfect size, color and pattern. I couldn’t have been happier. The entire weekend I walked by the living room and a feeling of complete and utter satisfaction came over me as I gazed upon my purchase. I walked on my rug and felt it was the best purchase I had ever made and it was worth every cent I had spent. Aside from picking out my husband, it was one of my bigger decisions as a new homemaker. After all, this rug was going to be with us forever. Then Monday came. I went to TJ Maxx to return some items and while standing in the service line my friend spotted me and called me over to where she was shopping. TJ Maxx was having a rug sale. She couldn’t decide between a needlepoint rug and a wool hook rug for her daughter’s bedroom. Both were beautiful and as I was assessing my pick, my eye caught a pale colored patterned rug off to the right. Gosh, that looks familiar. I looked at my friend and quickly said, “Go with the hook rug” and I bee lined it for the rug in the corner stack. It was the same color and pattern as my precious new rug. It was a 4 x 6 but it was my rug that much I knew for a fact. How could this be? I bought my rug from a special rug place that advertises in Architectural Digest. I paid thousands of dollars for my rug. I waited 16 weeks. My rug was not a random discount store choice but a well thought out decorating decision. I called the rug man – I was slightly frantic and possibly a little psycho (from his point of view). He said maybe it was a knock -off “You know, a faux rug”. “HAH” I said, “I know faux and that ain’t no faux – it is the real deal, it even has the Pandy Cameron label”. My special carpet that I so painstakingly purchased and a just hours ago was a source of such pride was not so special after all. In just a few hours, it had gone from dream rug to discount rug. Isn’t perception of value a funny thing? I wasn’t laughing at this point but you get it. The rug itself was no different but all of a sudden it had a serious fall from grace in my eyes. It was not like buying a knock off purse or jewelry where you knowingly are getting seconds or faux goods. No, it was the real thing but being sold in the wrong place. a very wrong place. Like buying real Tiffany jewelry at Costco and putting it in a some old crappy box that used to contain cartons of Wisk instead of that lovely robins egg blue box. It just wasn’t right. Bob was oblivious to my rug dilema and his only comment was – “It’s a great looking rug”. Ugh! Now the timing of this whole scenario was key in that I had gotten the rug on a Friday and here it was only Monday. I think had more time elapsed the result might have been different. But this is how it went down. My rug man called the manufacturer and was told that they repossessed the entire inventory from their US distributor for failure to pay their bills. The manufacturer then sold off the entire US inventory to TJ Maxx who bought it all at a for a fraction of it’s original price and then passed the great savings on to it’s customers. I just didn’t happen to one of them. Who knew? But wait! The manufacturer and my rug man were very sorry about this little problem and wanted to send me a check for $3500.00 to cover the discount. Would that make me happy they asked? I always like when people want me to be happy. I am so nice when I am happy. Unhappy? Not so much. I put my shopping morals aside and took the freaking check. I mean really, the rug looked great before and at half price, it was looking fantastic. OK, Bob was right on this point. Another win- win, I could now justify shopping at TJ Maxx more frequently hoping to spot more great deals plus I had all this extra cash that was just a burning a hole in my pocket. And just as I suspected, the kids spilled drinks on it, the dog pooped on it and the cats have thrown up on it. I didn’t see our house-fire coming but even though we lost most of our possessions and the rug was covered in ash and water, it cleaned up beautifully and I still have it in my living room. I will keep that rug forever.